Celebrating 87 years of excellence, NJLS is an award-winning courier and service of process provider for the New Jersey legal community and offers cost-effective pickup and delivery services to a broad range of businesses and government entities. NJLS received the Gold “Best Courier Service” seal by legal professionals who voted in the 2012-2015 New Jersey Law Journal (NJLJ) Reader Rankings surveys. NJLS received the Silver “Best Process Server” seal in the same 2013 NJLJ survey and the Bronze seal in the 2014 and 2105 surveys. The ballots consisted of more than 60 categories, including litigation support. Hundreds of lawyers and legal administrators participated in the voting. With its decades-long courier record since its founding in1929, NJLS has expanded its business-to-business pickup and delivery offerings to the realty and bank industries, to the medical community, and to counties and municipalities throughout the region. 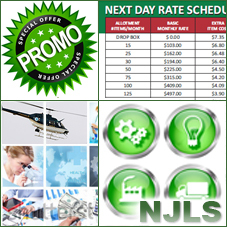 NJLS’ delivery offerings enable these clients to save up to 80% on NJLS Next Day and 50% on NJLS Same Day as compared to leading global carriers’ services. NJLS enhanced its courier services with Sunday evening drop-box pickups. Through our trained professional couriers and fleet of modern fuel-efficient vans, we process more than 3 million documents and packages annually. Today, in New Jersey alone, NJLS has more than a dozen professional process servers working 24/7—many of them notaries public—and has partnerships with hundreds of process serving agencies across all 27 counties and 50 states. In addition to service of process, filing and document retrieval, NJLS offers investigation services, including skip tracing and accident investigations. All courier and process service requests—from purchasing index numbers to serving papers—can be entered and tracked online via the self-service NJLS Client Login site. Clients can check on the progress of their jobs at any time online, ensuring their requests are completed.